Wine Makes Me Happy 4 1/4" Cube Rustic Wooden Shadow Box / Cork Holder | BUDK.com - Knives & Swords At The Lowest Prices! This rustic wooden shadow box - with its old-school, stencil-style lettering, stylishly faded paint and realistic weathering - looks fantastic on any wall, mantle, countertop or practically anywhere you place it, and, best of all, it expresses funny, timeless messages to all who see it. “Wine Makes Me Happy,” the box reads on one side in off-white, weathered stencil letters. 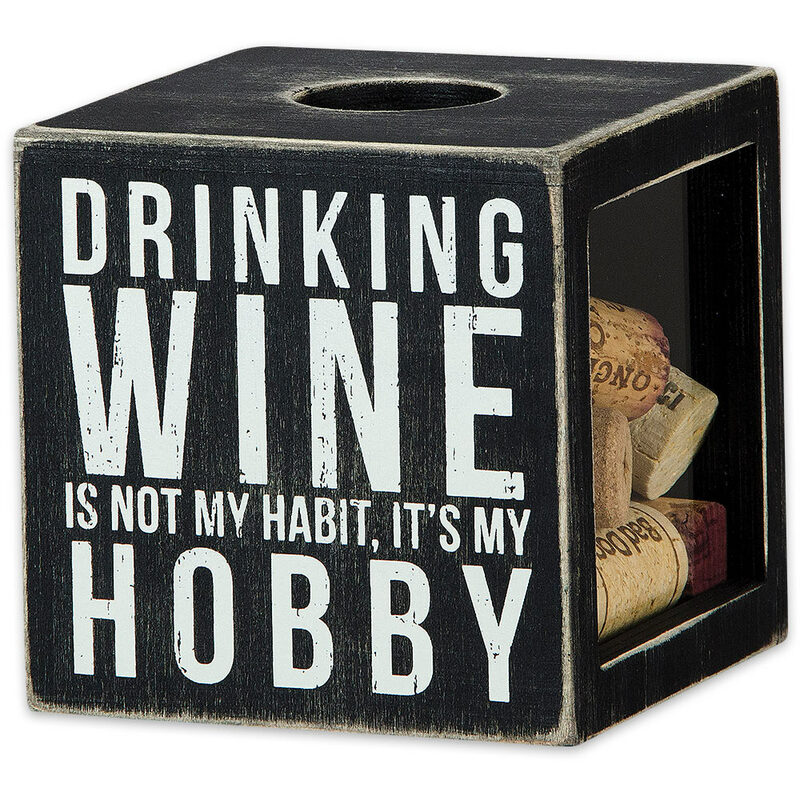 In the same text style, “Drinking Wine Is Not My Habit, It’s My Hobby” is emblazoned on the opposite side. What hilarious, universal truisms! The two sides not covered in text include transparent glass windows to show off your collection of wine corks; after polishing off a bottle, just drop the cork in the convenient round hole on top. It’s also great as a temporary holding vessel for corks destined for use in cork crafts like hot plates and glass table linings. Of course you can fill it with anything you like - bottle caps, marbles, polished stones - the sky’s the limit! No matter what you fill it with, rest assured this handsome vintage-style shadow box will look amazing. It’s painted a gracefully worn, tastefully faded black, and at 4 1/4" high x 4 1/4" long x 4 1/4" deep, there’s really no wrong place to it. It livens and adds a touch of traditional rural grace to any living room, bedroom, kitchen, dining room, den, office, garage, home bar or man cave, barn - the list goes on. Get two - one for your own home, one to gift to a fellow wine enthusiast. Thankfully, it’s easy and painless with our unbeatable prices! Glance at this stately, eye-catching shadow box every time you walk past it, and remember that no matter your current troubles or the stresses you face, there’s never a bad time to calm those frayed nerves with a tasty glass of vino! Cheers!